Our Guinea Fowl Formula is packed with lean protein and low in saturated fat. It is also rich in iron, for healthy blood cells, and phosphorous, for optimal bone health. 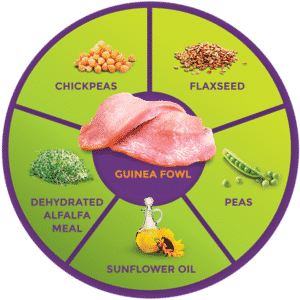 Guinea Fowl is also a novel protein source, so it could be a great way to start an elimination diet for dogs who have sensitivities or allergic to certain meats, such as chicken. Our Guinea Fowl Formula is also grain free, and balanced with low glycemic carbohydrates to keep your dogs healthy and strong. Zignature Guinea Fowl Formula – Learned from Nature, Crafted to Perfection. Guinea Fowl, Guinea Fowl Meal, Peas, Chickpeas, Pea Flour, Sunflower Oil, Flaxseed, Natural Flavors, Calcium Carbonate, Salt, Choline Chloride, Taurine, Vitamins (Vitamin A Supplement, Vitamin D3 Supplement, Vitamin E Supplement, Niacin Supplement, d-Calcium Pantothenate, Thiamine Mononitrate, Pyridoxine Hydrochloride, Riboflavin Supplement, Folic Acid, Vitamin B12 Supplement), Dehydrated Alfalfa Meal, Tricalcium Phosphate, Minerals (Zinc Proteinate, Iron Proteinate, Copper Proteinate, Manganese Proteinate, Sodium Selenite, Calcium Iodate), Potassium Chloride, Carrots, Blueberries, Cranberries, Preserved with Mixed Tocopherols. Click here to explore what’s inside our food.